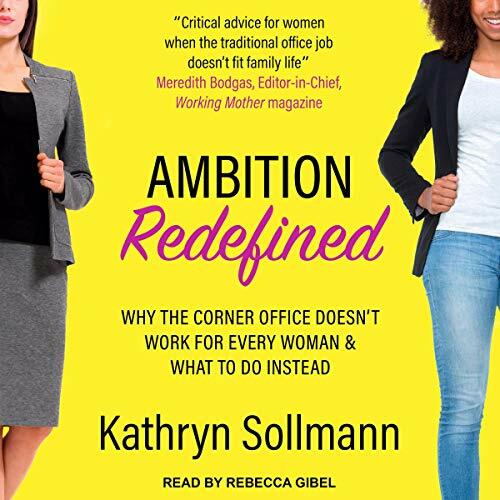 Ambition Redefined is a timely alternative to current women's business books that define professional ambition and success as climbing the corporate ladder. In fact, this is not a path that all women want or should feel pressured to follow. Sollmann's focus is on the more critical and widespread workplace issue for everyday women - to always work in a way that fits their lives alongside their two major caregiving roles: for children and aging parents. It's not "worth it" unless the salary is high. Women forfeit up to 4X their salaries every year out of the workforce to care for children and/or elderly parents - and it does not take a six-figure salary to achieve long-term financial security. Finding flexible work is impossible. Sollmann shines a bright light on the ever-widening world of flexwork - where women can find many interesting and exciting ways to tuck all generations of their families into a future that is financially secure and safe. Work ends at age 65. Women who leave the workforce and want to return in their 40s, 50s, or 60s will be in good company as the ranks of older workers rise.